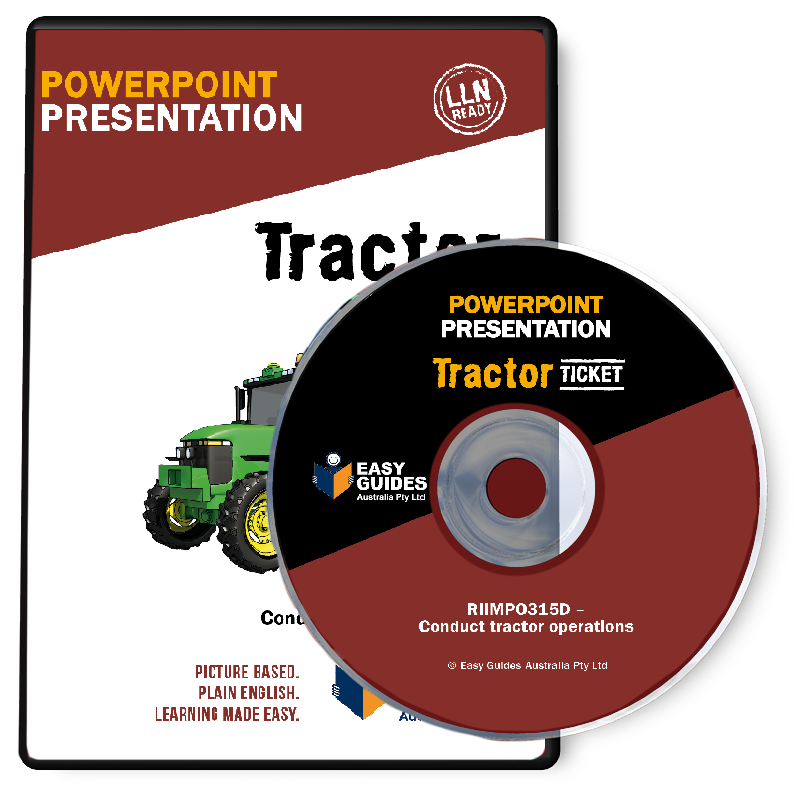 This is a PowerPoint Presentation of the Tractor Learner Guide. It is a compact summary of each performance criteria in the unit and will help prepare a learner for their final assessment. The PowerPoint Presentation is available on either a CD or USB. 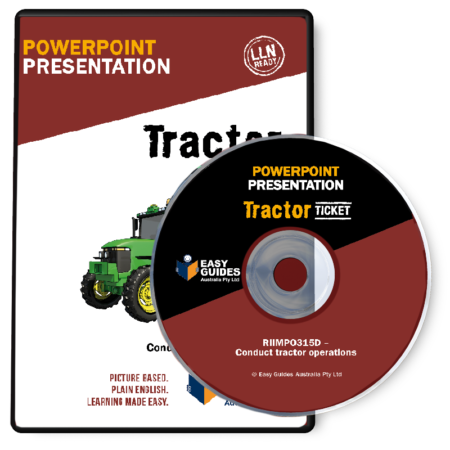 Although tractors don’t require a licence, this PowerPoint Presentation will help meet the requirements of the Occupational Health and Safety Act: that an employer must provide employees with information, instruction and training to perform their work safely. It will also help those who use tractors to operate them safely. For registered training organisations (RTOs) this presentation covers all the elements in the Unit of Competency (RIIMPO315D) Conduct tractor operations. This unit forms part of the Training Package: RII Resources and Infrastructure. Easy Guides is dedicated to making it simpler than ever for trainees looking to enter the industry and professionals looking to upskill to get on the path to a new certification. We produce a range of materials helping people better understand how to safely operate and perform routine maintenance on tractors, as well as a range of other industrial and agricultural vehicles including forklift trucks, civil construction and earthmoving machinery. Where organisations are engaged in work in high risk environments such as enclosed spaces, on scaffolding or at heights, our training materials, safety documentation and checklists help ensure you’re always operating in full compliance with all relevant legislation and regulations. Make the right choice for your organisation and choose the Easy Guides range for your next educational course. 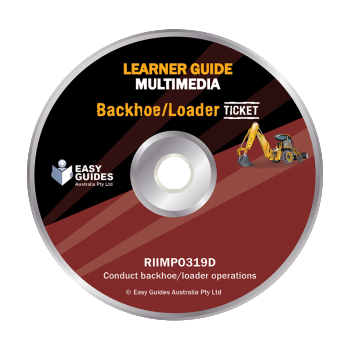 Order today, or get in touch with our Boronia office via email at admin@easyguides.com.au or call us directly on 1300 733 220 and one of our team will be happy to guide you towards the most suitable materials for you. Categories: Tractor, Tractor, RII Earthmoving Multimedia.